Search Google for “dinosaurs“, “Jupiter,” “Genome,” “WWII“, “Impressionism“, or “Monet,” and the first hit is usually not a museum, school, or commercial publisher. It is Wikipedia. Wikipedia ranks high in search engines for most non-commercial queries. Wikipedia currently has 3.7 million articles in English, and an additional 15.7 million articles in other languages. The popularity of Wikipedia articles is a long tail distribution. A few hot topics are viewed millions of times a day. For example, on 23 July 2011, when soul singer Amy Winehouse died, her Wikipedia page was viewed 8 million times. More typical, the top 100 articles (topics like Steve Jobs, United States, Harry Potter, Miley Cyrus are read around 25k times a day, with traffic depending on spikes in public interest from current events. The end of the long tail includes hundreds of thousands of esoterica which are read only a few times a year. Articles in Wikipedia have a long shelf life, and most last indefinitely. Whereas content on your web site can die of obsolescence, be buried in the archives of a blog, or otherwise lost through staffing and technology changes; content added to Wikipedia sticks around for years, and will further improved and reused by scholars and amateurs. Wikipedia articles evolve. 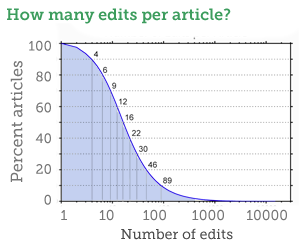 The median Wikipedia article has 16 edits, and 30% of articles have fewer than 10 edits. Articles are occasionally subject to vandals, ignorant editors, or editors with an axe to grind. But vandalism is usually fixed quickly, and most scientific and cultural topics are monitored by well-meaning volunteers. You can use Wikipedia’s “watch list” tool to keep track of your articles and fix problems. Your organization’s name is not closely affiliated with the article, and potential flaws introduced to an article in the future will not be blamed on you; they will be blamed on Wikipedia. Wikipedia’s rules require that contributors be single individuals, so your organization’s outreach department can not have a shared account. Wikipedia has grass roots beginnings, and has a systemic bias against organizations, corporations, and public relations. The intention is to maintain a neutral, objective approach. Giving to Wikipedia means giving to the public. Content in Wikipedia, by definition, loses copyright. Any content you contribute to Wikipedia needs to be new or be public domain. Wikipedia must scrupulously avoid copyright infringement, so many volunteers watch to prevent content from being copied from other sites. The result is that educational and outreach staff can not re-post your own institution’s existing content to Wikipedia verbatim unless you release the source content (and label it as such) under Creative Commons Attribution-ShareAlike. Or you can follow steps to officially donate your own material. You also need to disclose potential conflict of interest, but that’s easily manageable. 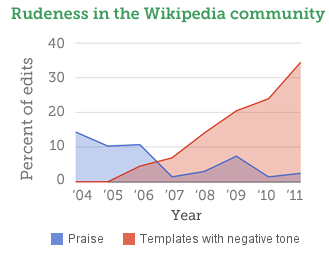 The learning curve to do meaningful work with Wikipedia is steep but short. But the personality problems are pervasive. Wales says the typical profile of a contributor is “a 26-year-old geeky male,” not professional educators, scholars, writers nor outreach professionals. By the time you contribute a few dozen articles, you will encounter obstructionist personalities. Keep in mind that these antisocial people play an important part of the Wikipedia ecosystem because they remove the thousands of petty vandalisms which happen every day. You will have to ignore bad attitude of occasional bad apples, and not get discouraged. Wikipedia is built on secondary and tertiary sources. Virtually everything you say in an article has to be cited, and verifiable in some other source. You can cite books, news articles, journals and magazines, but Wikipedia discourages citing primary sources. This policy is intended to make sure that all statements have passed through some kind of institutional filter. But it doesn’t make much sense for culture and science, which often have peer-reviewed research, artwork, objects, or data. The guidelines say, “secondary or tertiary sources are needed to establish the topic’s notability and to avoid novel interpretations of primary sources, though primary sources are permitted if used carefully.” Ironically, peer review (e.g., a paper in Science magazine) does not count; but if your institution has a complex internal editorial review, your in-house publications might count as secondary sources. It’s easy to get started on a small scale. In minutes, you can make an account, and start contributing. If you want to make large contributions or add pages, look over some of the orientation guides. These guides vary in quality and are occasionally contradictory — but there are “no rules” and most good contributions, backed up with secondary sources, are welcomed. The best starting point for cultural and scientific projects is the Wikipedia GLAM pages. (GLAM is an acronym for Galleries, Libraries, Archives and Museums. It also incorporates other institutions such as theatres, zoos, botanical gardens, public broadcasters, etc.) Those pages will point you toward relevant regulations, and give you tips on getting started. Many of the GLAM guidelines also apply to science and technology related outreach. The challenge remains of finding staff time and resources. The key here is to draw in volunteers. The GLAM pages have several ideas about how to connect with existing “Wikipedians,” get your own volunteers involved in Wikipedia, make”content donations” so there are more raw materials available for volunteers to work with, or set up internships dedicated to Wikipedia. If you set up an internship, recruit a Wikipedian, and give your intern the job title “Wikipedian-in-Residence.” Archives of American Art currently has a summer Wikipedian intern, Sarah Stierch. The biggest advantage, says Sara Snyder, of a Wikipedian intern, is that it’s hard to learn the ins-and-outs of Wikipedia without bringing in an Wikipedia insider who has already learned the ropes. Snyder says, “I have lurked and done light editing on Wikipedia for years, but I never understood what it was really about, how it functioned, why things are the way they are, until I had some people who were able to speak to me face and face and start explaining and answering my questions. Having [our Wikipedian-in-Residence] Sarah here has made me a thousand times more confident/competent as an editor and advocate.” A secondary benefit is that the residency raises awareness of Wikipedia among institutional leadership. 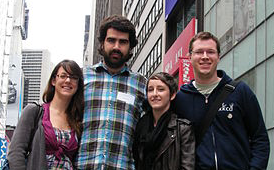 Since summer 2010, there have been nine volunteer interns (e.g., a grad student) or staff given the job title “Wikipedian-in-Residence.” (Four are in the photo at right.) The title is useful for the intern or staff person because it defines their job, and helps them build collaborations with other Wikipedians. Your intern can collaborate with your organization’s staff to improve articles, organize local events which help excite volunteers, organize challenges or competitions which motivate more volunteers, or serve as your bridge to teach in-house staff about Wikipedia practices and values. Snyder says she would love to have more Wikipedians intern at her institution in the next few years. Events like meetups and/or edit-a-thons boost energy of volunteers and staff. Snyder co-organized an event with Stierch in late July. Snyder was inspired by the enthusiasm of the ten Wikipedians who attended, and impressed by the intelligent questions and engagement. The event also puts a human face on Wikipedia for the Archive’s staff. Events have trickle-down effects, from attendees, to their colleagues in cyberspace, ultimately increasing the volume of work done by volunteers. Working with Wikipedia also boosts inbound web traffic. Wikipedia has long been a top-5 referrer for the Archives of American Art web site, but since June 2011 when Sarah started working, Wikipedia has been the #1 inbound referrer. Sources not noted above: Wikipedia stats from WikiRoll; April Wikipedia Report card; and I attended the Backstage Pass Tour of the Archives of American Art, on Friday, 29-July-2011, organized by Wikipedian-in-Residence Sarah Stierch, and webmaster Sara Snyder. I really enjoyed your blog posting. I know there's a push right now for more content from universities on Wikipedia, but I think that museums, local genealogy societies, libraries, etc. would have wonderful things to contribute. Annette, Wikipedia is always looking for the contributions of any organization that might have information that they would like to share with the public. Wikipedia is about being free and open with knowledge and information, and sharing it in a neutral and even way. I hope you encourage organizations you are involved with to help us build Wikipedia! I’ve been sitting here in my underwear for two hours now, and finally got the chance to read your post. Great stuff.